I try to visit London whenever I can. A friend from the walking group was heading down there for the weekend, so I tagged along. As I’ve said before, its like visiting another country, and its only 2 hours on the train. 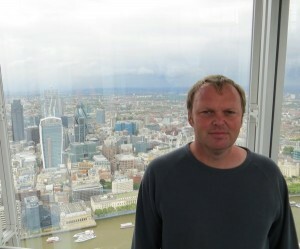 The photo above is taken at the Shard viewing platform, but more about that, later in the post. Just out of interest, the jumper I’m wearing in this photo is from Rohan. I bought it, because I didn’t think it looked like the kind of jumper I usually wear, and I was experimenting with changing my image. I’ve been told since, that it looks exactly like all the other jumpers I own. Feel free to post if you agree/disagree. 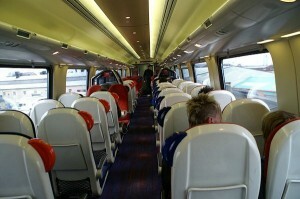 We got the train down to London around lunchtime on Friday (to make the most of the weekend). I always like Friday afternoons away from work. Its the feeling that the weekend has begun early (I still had 3 calls from my team, but nothing urgent). Glass of wine on the train, entertaining conversation, and we’re there before you know it. We’re visiting Mayfair (but not trying to strangle any celebrity chefs, this is strictly an exploration/sightseeing tour). The wine I’ve drunk on the train is getting lonely, so on the way to our weekends accommodation, we stop at a really nice bar/restaurant called Browns. We spend the next 2 hours relaxing and chatting. I don’t normally go for the London social scene (I’m more of a see the worlds most famous sights kind of guy). On this occasion its genuinely fab relaxing there. In the end I have to be practically dragged out (not unusual for me in a drinking establishment, but on this occasion, it isn’t by the doormen 🙂 and were on our way. We end up staying at an apartment owned by my friends company. As we arrive at the entrance, its pretty impressive. We open up, start to unpack our bags and have a look around the place. 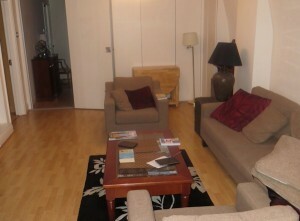 It has wi fi, tv and a really nice relaxing lounge. 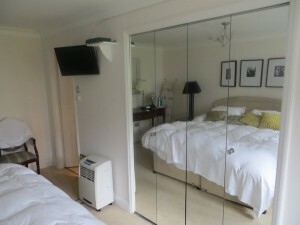 Even better, it has 3 double bedrooms (2 are en-suit). I love this place. We head back to Browns for dinner, then get some rest (its a feature packed trip, there’s loads to do and we’ll need all our energy to get the most out of each day). The next day, we head out to a traditional pub (the Kings Head) where I practice my Cockney. 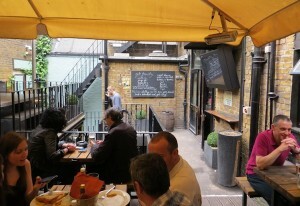 The pub is quite nice, and on about 3 levels (I mean with stairs, not any intellectual nonsense). 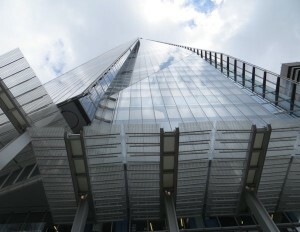 We head around the corner, to visit our first sight of the day, the Shard. 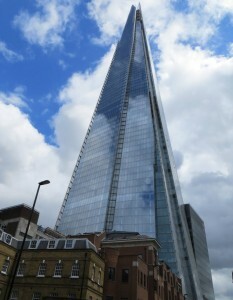 Its the largest occupied building in Europe, and one of London’s newest. The view from down the street was impressive, but I found the view from the foot of the building, to be even more so. We only have to queue for a few minutes, then were in the lift (which goes at a hell of a speed). 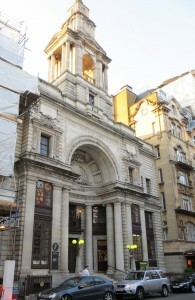 There is a picture inside, that shows the different levels within the building. 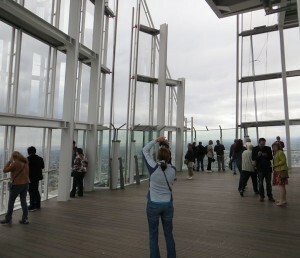 I thought the viewing platform might be inside, but its very “open air”. The view outside was amazing. You can see for miles in every direction, and computer terminals help you to identify different buildings. We head back to our hotel, get changed and have dinner at a Moroccan restaurant called Tagine in Sheep market (a brilliant place, but sadly I cant find website for it anywhere). We head for the West End. It was really busy and there were crowds everywhere. That said, there was a real buzz in the air and a great vibe. The main purpose of the trip, is to take in the theatre. 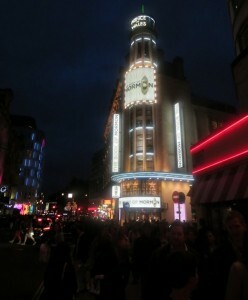 I’ve never been to a West End show, and I was really looking forward to it. To be honest, I always get embarrassed at musicals and I was a bit nervous. I’m not frightened of stepping out of my comfort zone though. This play is a sell out every where in the world that its been shown so I’m prepared to take a leap of faith (pardon the pun). 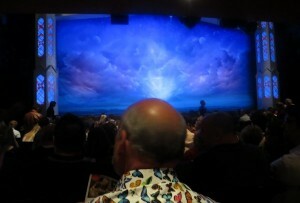 The book of Mormon satirises religion generally, but focuses on the church of the latter day saints (who most of us know as Mormons). Won’t spoil the plot, but some idealogical elder Mormons travel to Nigeria, where their faith is tested. The play was written by the people who make South park, so it was far from conventional. In honesty, watching it for 2 hours was one of the most amazing experiences of my life. One superb song stayed in my mind. I believe. Do I believe that God is real ?. I’d only answer a question like that in person. Do I believe in Karma ?. Well, when I arrived, I was told I couldn’t take any pictures inside the theatre. I lined up a nice shot, which I took in secret. I ended up with this bald head in the middle. I’ll answer yes to that one. A couple of drinks in the City (with some of the most polite doormen I’ve ever met) and then off to bed. In the morning, we decide to go exploring and set of wandering. Although the Olympics are a year ago, there are still lots of signs of it, and as we walk under an underpass, there are famous quotes by English poets and philosophers. 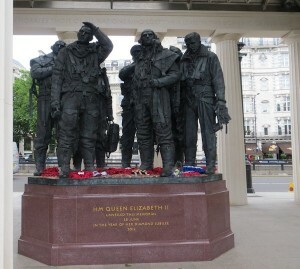 We pass by Green park and see the 9 foot high memorial to bomber command pilots in WW2. It also contains an inscription remembering the Germans killed by the bombs (although the 55,000 airmen who died are hero’s here in the UK, they killed half a million Germans, and the bombing raids are considered by some in that country to be war crimes). A sobering experience for a Sunday morning. It reminds me that my freedom to visit another city, wander around it and write pretty much whatever I want on my blog isn’t free. As someone once said, everything in life has its price, but sometimes someone else has to pay for it. We find a very nice cafe nearby and have breakfast. My breakfast arrives with chips (they have some odd habits in London) and its £9.50. Its also delicious, so I just get on with eating it and drink the delicious coffee. Visiting London and not visiting the world renowned (and free) museums, is a bit daft in my opinion. I wanted to visit the science museum anyway, but in addition they had an exhibit dedicated to Alan Turing (I have many heroes, but he’s probably my greatest, and johnsunter.com is dedicated to him). 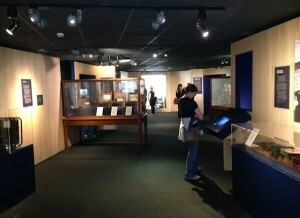 The exhibit was due to run for a year, and excitingly, would finish only 8 days after we left London. Coolest of all, we would be visiting it in Turing’s Birthday. As I wandered around the museum, I was surrounded by children. I dont really like children, but in a museum, I can forgive them their loud boisterous behaviour, as I know their excited about science and learning something useful. They had loads of interesting exhibits, including a couple of Enigma machines, loads of stuff about mathematics, some video’s about stopping the German U boats and other stuff about the Turing test. The other stuff was good, but I’ve seen and read most of it before. 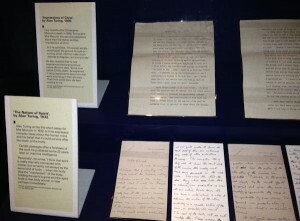 Most fascinating to me, were the collection of letters written by Turing personally. 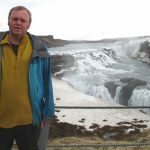 The letters to friends and the mother of his growing up friend Christopher Morcom after his death, gave an insight to the man himself. In the case of Christopher, he was heartbroken, and as a result became an atheist. Favourite of all, was one exhibit about his first day at an independent school in Sherborne. I’d heard this story many times, but it always warms me to read it again. It fell during the general strike of 1926. In order to arrive at school on time, Turin rode 60 miles by bicycle (not like the ones we have today) stopping over at an Inn on the way. In my mind, fate/nature/god may have made him a genius, but the determination was entirely down to him as a person. Reflective after the Turing exhibition, we popped to get some coffee. I wasn’t going to miss out on the other cool stuff in the museum, so headed straight back out to do some exploring. First stop the computing section. 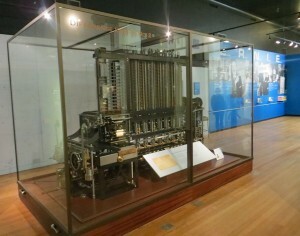 The Babbage computational engine number 2. 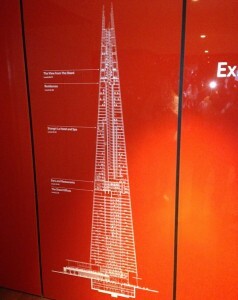 Never built in his lifetime, it was built from his original drawings by this museum more than 150 years later. Its reckoned that had it been working during the 1st and 2nd world wars, it would have enabled artillery to fire with accuracy an order of magnitude greater which would have changed the balance of both wars. Not to over-dramatise, but its the 2nd time I’ve visited this section and it was an honour to stand in front of this machine. Low tech by today’s standards, was this speaking clock. It uses very simple vinyl record type technology, but for most of my growing up years, a nuclear clock was “off the table” and if you wanted really accurate time, you dialed 123 on any phone. What I didn’t know back then, is that 1 of 8 machines like this one was what the nation was listening to. I didn’t get a photo of it, but the MONIAC computer was off particular interest. 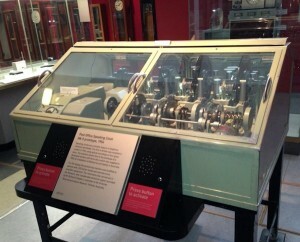 Described as a hydraulic computer it used red fluid to simulate money in an economic environment. ie, you increase taxes, there is less disposable income and investment goes down. Not sure of the economics exactly, as I dont completely understand them, but made for a fascinating demo. The one we looked at, had the fluid removed to stop degradation, but there was a video showing it in operation (link above) which is really useful and interesting. Our adventure almost over, we head back into the city. 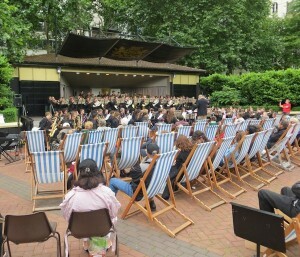 We find this area, where there are deck chairs and a full orchestra are playing all sorts of traditional tunes. Our final stop before the train home is the national portrait gallery. I’m instantly reminded of the scene in Skyfall with Bond and Q meeting for the first time. I wander around and see that a talk is taking place in one of the rooms. Its amazing, but obviously goes on for 3 hours, led by someone who’s passionate about the subject. I’m instantly saddened. I would probably need 6 months off work and to live around the corner to attend each lecture and know all of the treasures in this building, and that’s just one museum. I begin to get overwhelmed. 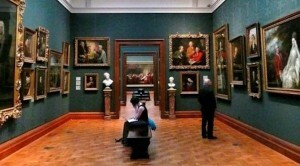 What about all the other fascinating museums and historical place in London ? 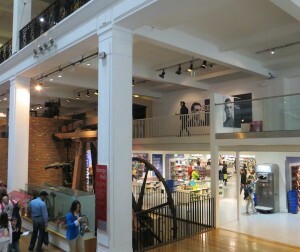 What about all the other fascinating museums and historical places in the UK ? What about all the other fascinating museums and historical place in Europe and the rest of the world ? That’s when I start to smile, my frustration gone. That’s the whole reason I’m here. The search for adventure. I’ll never see everything. Its not a problem to be solved, its a journey to be enjoyed. 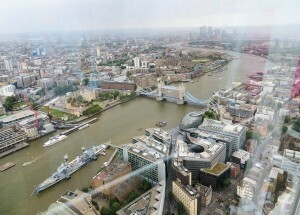 If you haven’t been to London recently, go there soon. 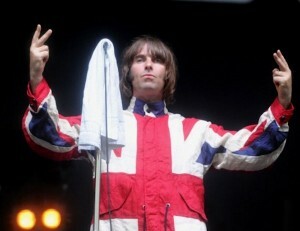 Its brilliant. Pressure is on at work, but instead of vegging out at the weekend, I’m determined to make the most of them and get out and about. On Friday evening, I had a barbecue at my house. A slightly unusual affair as I couldn’t get the Barbecue to light, and ended up cooking the food under the Grill. Thanks though to Glenn and Dave E for bringing burgers and Tandoori Chicken. It was an exciting evening, what with old men falling of bicycles, and demonstrations of nunchaku sticks and everything. Overall, a brill evening, thanks to everyone who came. On a day walk a couple of months ago, a mate called Dave, recommended a weekend away at a place called Bishops castle. It’s a beautiful spot in the middle of some great walking country, has a fab camp-site and 10 mins from a town with some good pubs and cafe’s. Just like I always do, I added it to my mind-map, and decided I go. A Saturday/Sunday project was opted for and we arrived there about 12 lunchtime. We went on a walk. Unfortunately, a lot of the gates were locked. 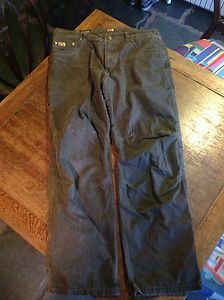 While traversing some barbed wire, I ripped my Rohan trousers. My friends instantly offered support, realising how upset I’d be. I remained upbeat, and pointed out that it would be far worse if I’d ripped my scrotum or something serious like that. 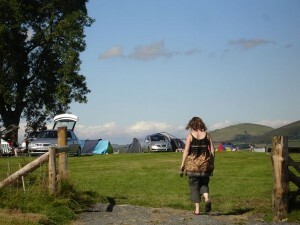 Although the camp-site is lovely, the weather forecast wasn’t looking good. We opted for the bunk house (at £10 per person per night, offered superb value). 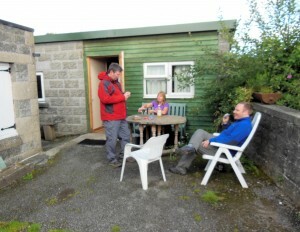 Having finished the walk (and had 2 pints along the way) we returned to our temporary home for a sit down. Inside there were 2 rooms, each with a single bed and bunks so it could hold 6. 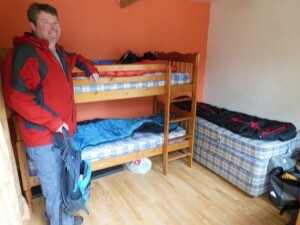 This camp picture of Alex, shows how roomy it was, and it had a laminated floor and kettle. 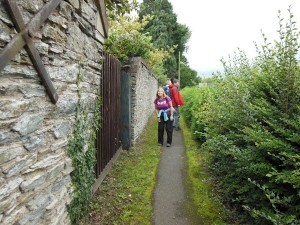 But walking weekends aren’t just about boots on the ground. 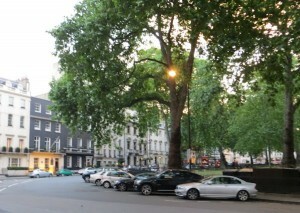 In the evening we head into town. I always take a personal pride in the way that we help struggling businesses to get through the recession (and at the same time get completely tater’d, spend time with friends, and have a great laugh). A pub Dave had recommended (which wasn’t cursed with “real ale” exclusivity) was The 3 Tons. I absolutely loved that pub. 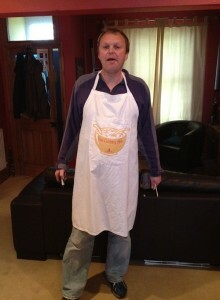 I’m known locally in Chester as a man of arts, and a high brow foodie. I decided to try the local culinary offering. 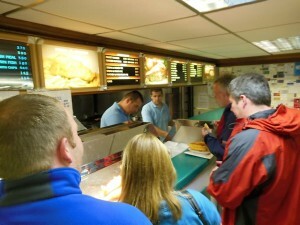 The fish and chips were delicious. Only thing was, the price was based on the size and amount of fish, which seemed a fairly hit and miss affair. Prices ranged from £4 to £6, with seemingly no clue as to the difference. 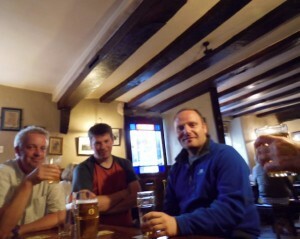 A visit to 2 more pubs. One in the middle of the high street, catering for a younger audience (but with superb music). Further down the street, our last pub of the night featured woman doing the monkey dance from Jungle book and the same song being played on a jukebox 5 times. It was a comfortable night all told. I awoke in a bit of a grumpy mood (for which I’d like to apologise) but quickly pulled around. We decide to head into town for some breakfast, and settled on a superb place called The Poppy house. Before anyone asks, there was no “Amsterdam” type products on sale, just wholesome food and tea & coffee. Finished breakfast, and then back to the camp-site. Sadly, Glenn had to leave us, and head back to work, so we bid him farewell (I was going to say something sarcastic about him ripping off old ladies, but the truth is, Glenn is one of the most genuine business men I know). Worse was to come. When we actually arrived at the walk, I felt a little “out of sorts” and so had to lie down. 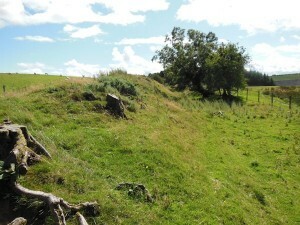 My friends did the walk, and I found this spot next to Offa’s dyke to lie down. Three hours later, I meet up with my friends and we all head home. Overall, a brilliant weekend, I’d definitely recommend it to anyone considering a weekend away. Well, its been all go with the Sunter foundation. As you may know, the Sunter foundation’s main goal is the promotion of pub tolerance. 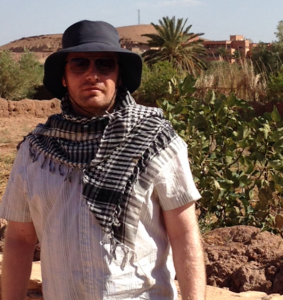 When I was in Morocco a few years ago, I could hardly find a bar anywhere. In the whole of Marrakech, I only found 1 bar which sold 3rd of a pint cans for £2.50 each !. In anticipation of the days when when things change to the way they are in the UK (warm beer in a cracked pot, with a wasp in it !) Glenn has been boots on the ground in that country, spreading the word. I haven’t had a progress report yet, but I’m sure Glenn has made small work of crossing the cultural divide, and along the way, may even have had time for an adventure or 2. Years ago, I always wanted a Berghaus waterproof jacket. 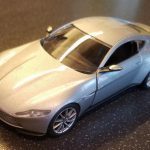 It was ages before I could eventually afford one, as even in those days, they came in at around £280 !. In the end I got one, but what do you know. Almost overnight, city centre scally’s got an attraction for them too, and wherever I went there were gangs of hooligans dressed just like me. Reason I mention this, is at Christmas, Glenn left a catalogue at my house. It was called Ice and Snow (or something like that). They had some really good outdoor/casual trousers. Had a bit of a daft name, as they were called Kuhl revolver, but I liked them and bought a pair. I didn’t buy them from the catalogue, as they were almost £100. Instead I found them on the internet at Taunton Leisure. I’ve since bought a 2nd pair, and it takes a lot to say this, but they are more comfortable than any of my Rohan trousers !. Anyway, problem is I’ve started to see loads of people wearing them now. So, before the world steals my dream, I want to stake my claim, that I was wearing them first. My friend Nick Barker came down to visit a fortnight ago. He’s been down to Chester a couple of times, and its always a pleasure to see him. This time, to my delight, 2 things went to plan. Firstly, when I took him to see the Albion (for those that dont know, its a pub with a “war years” interior. 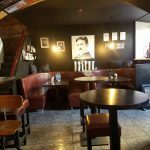 It literally looks like a pub would have looked during the blitz ) it was open. The few times we’ve been before, it hasn’t and he’s just had to take my word for it. I was starting to think that he thought it was just in my imagination, but finally it was open on a Friday afternoon and we had a couple of pints in there. Secondly, the Remembrance Garden. I go there quite often on a Sunday morning, to read and reflect. 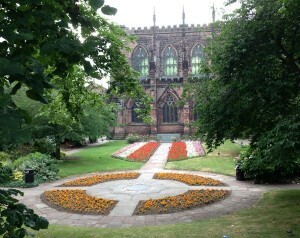 The garden itself, has a flower bed laid out in the form of the Cheshire regimental medal. Whenever I pass with friends, it always seems to be winter, and all you can see is soil. This time it was in flower and we were able to see it in all its glory. 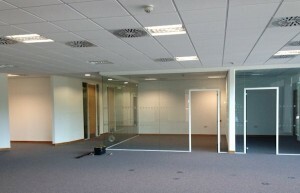 Office move continue”s on a pace. 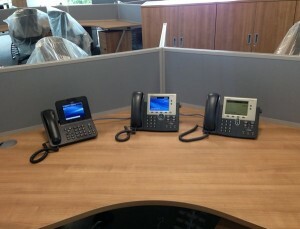 Main network is setup and working, and we are presently setting up the new phone system. We’re installing new printers later this week as well. Still loads to do, and exhausting work, but some of the most rewarding I’ve ever done. But its not all work work work. I actually have the coming weekend off. I’m having a Barbecue at my house on Friday evening and I’m spending Saturday and Sunday at Bishops Castle campsite with a few friends from the walking group. 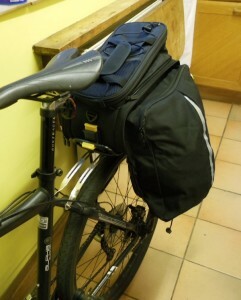 I finaly got the new panniers to go wiht the excelent pannier rack that Glenn got me for my birthday. 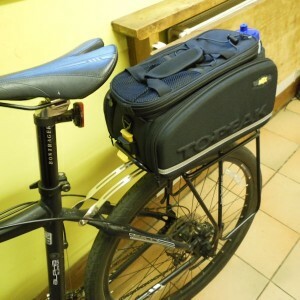 The panniers are the ideal size for knocking about town, but if your on a longer trip (like the one I do to Llangollen each year) they are expandable. * Couple of years ago, I felt like my kitchen needed brightening up, and I didn’t have much money. I ended up with this awful yellow. I’d like to apologise for the garish colour you can see in the background. The last couple of months have been difficult with my fish. 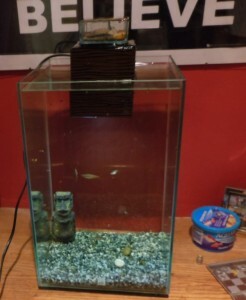 I came home one evening and found that 1 of my fish had died. I felt really bad about it. Was it something I had done ? Was there anything I could have done to prevent it ?. I didn’t know, so I put down the fish and chips I was eating, to give him a decent Christian burial in my Japanese Garden. Another died a few weeks after that, which left me with just 1, who looked really lonely (he shouldn’t have been, he still had me). Since then I’ve got 4 new ones and the 5 of them seem to be getting on fine. 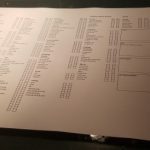 Finally, I’ve been updating some older parts of the website. If you have a moment, take a look at Frequently asked questions and 10 things I hate.